The next six months are a countdown in my life – or a count up, depending on how I look at it. That’s the issue right there, actually: am I brave enough to embrace change? Way to play on my anxieties, kid. I suppose in his wisdom there’s some truth to his strategy. I DID take it hard – I knew it was coming, I tried to prepare, but it wasn’t until I was sitting in her convocation freshman year that I could start to verbalize what I was feeling. I don’t expect a repeat next August when Cam moves across the country. Yes- he’s moving to Boston, just about as far as he could go from California. He was accepted early decision to his dream school, and without hesitation, he committed. Done deal, he’s going. Early decision is kind of nice, except for the fact that instead of starting my empty next visualization in May with most of the other parents-of-seniors, he kindly gave me five extra months of it. The silver lining? It made choosing my mantra for 2018 quite simple: EMBRACE CHANGE. I’ve been procrastinating on actually writing about the impending change for months. I guess that’s a strategy – avoidance, right? If I don’t think about it, it won’t happen…except, he’s 18 and reminding me daily that he’s an adult and that I should get used to it. As the days pass, he’s less and less patient with me, and I’m finding myself more and more often in my upstairs writing perch, candles lit, gazing out the window and wondering if I’m actually brave enough to break my own heart….as a mother. Now logically, I know there’s no choice. My heart will break a little more each day, the cracks carefully covered with smiles and hugs and making his favorite meals. I’ll play along with the ‘when I”m in Boston’ talk, and remind him that roommates don’t like people who leave their wet towels on the floor. I’ll grin when he comes in for a hug now and then, and compliment him when his room looks clean and he goes out of his way to fill the gas tank. I’ll be grateful that he texts me from his girlfriend’s house, and rest easy knowing that at least her parents are getting to see what a nice young man he’s becoming during all the free time he spends hanging out with them, not us. And I’ll let go of what’s no longer serving me – the story of all the things I thought I would do when he was little, the trips we never took, the books I never read aloud. I’ll let go of all that part that tells me what I should have done…and try to hang on to what I did. I was recently listening to Cheryl Strayed talk about her writing and her reflections on motherhood, and she shared a story about making decisions as a mother that really resonated with me. No one prepares us for motherhood; we do the best we can with what we have, and hope that everything turns out ok. Along the way, we learn to navigate the rough patches, smooth the hurt feelings and wipe away the tears. She reminded me of one of the most important lessons that motherhood has taught me: to do things that scare me and to let my kids do them, too. Making decisions for our children is a hard habit to break, even when we’ve been practicing for years. Sometimes when I tell other parents that my kids both chose colleges outside of California they tell me that they would never let their kids move so far away. I hear all sorts of excuses, but really, all I can think is how could I forgive myself if I never let them fly? I have to be honest – I KNOW I’m brave enough to embrace change. I’m sure I will survive. I made it through Cam’s adventures at the ski academy, and Lily moving to Utah. I know that like all those other times when I couldn’t imagine what it would be like to have a child that was any older than they were at that exact moment – that just like then, I’m going to find that with change comes joy just on the other side. With change comes a new opportunity to push away what isn’t working and amplify what is. I wear my mantras on my wrist, daily reminders of the words I promise myself. Courage. Trust the journey. Be here now. And now, embrace change. I trace my fingers over the letters, I twist and bend and alter their position but always, always the words are right there to remind me that yes, I am here and yes, I can. Being brave enough to embrace change isn’t easy – but it’s worth it. I’m going to trust in that. You go girl! 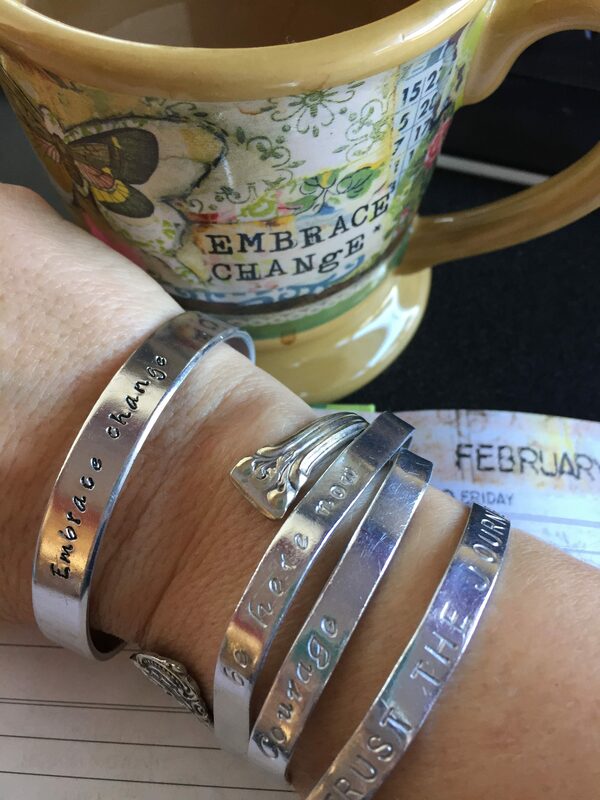 I love the mantra bracelets too — a beautiful way to remind yourself of the actions you want to take.